Peruvian restaurant moving from Astoria to Jackson Heights. Looking forward to Warique's opening. Does anyone know where in Jackson Heights? I'm guessing its either the El Rico Tinto or Swim Two Birds locations which is 10 blocks from Urubama a very popular Peruvian Restaurant 10 blocks East on 37th Ave & 86 Street. My guess is Northern Blvd. 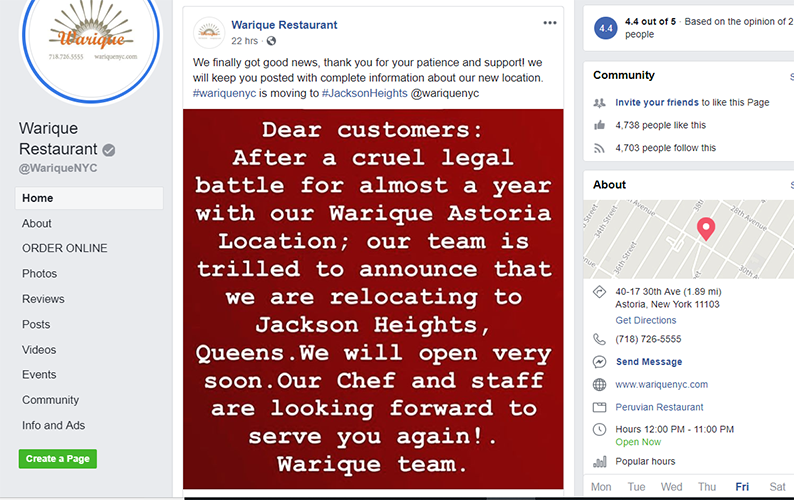 I just noticed that Warique updated its address on Facebook to 90-04 37th Avenue. That's the former Taco Mix location. Hmmm... I didn't get to try Taco Mix, but I assume the space is smallish. Anyone know? I've been there. Yes. It's tiny. This is really surprising. There was literally no seating. Only bar height table ledging along the window and part of the wall. The rest of the space was for standing around to place/wait for your order. Unless they shrink the kitchen — which seems unlikely because I would imagine they require more space than a taco joint — I don't think it's going to be the same kind of dining experience as what they had in Astoria. The owner/s of the restaurant must have made some adjustments to accommodate tables. According to this article from the Jackson Heights Post, there will be indoor seating for 18. Lozano is applying for a liquor license and for sidewalk seating to supplement the 18 indoor seats. Hmmm....it's a couple of blocks above Urubamba, a very popular Peruvian restaurant, and much smaller. I wonder if that will work. ljr: I was thinking the exact same thing as you. Its just 4 blocks from very popular Urumba which is spacious and has excellent food. They took the space on 90th Street because its significantly cheaper than space in the 70's which would have been a far better choice far away from Urumba. Warique will have to focus heavily on inexpensive take out in order to survive. Yes, convenience of location is so important--we live in the 70s and have been to Urubamba and liked it very much--but the truth is, we are too lazy and/or tired to walk all the way up there, so when we dine out in the neighborhood, it's always within just a few blocks. Same. Though when we want Puruvian, Anzuelo Fino takes the cake. @MrPlaza: I've never tried Anzuelo Fino -- thanks for mentioning it, I'll check it out. I don't mind walking at all.